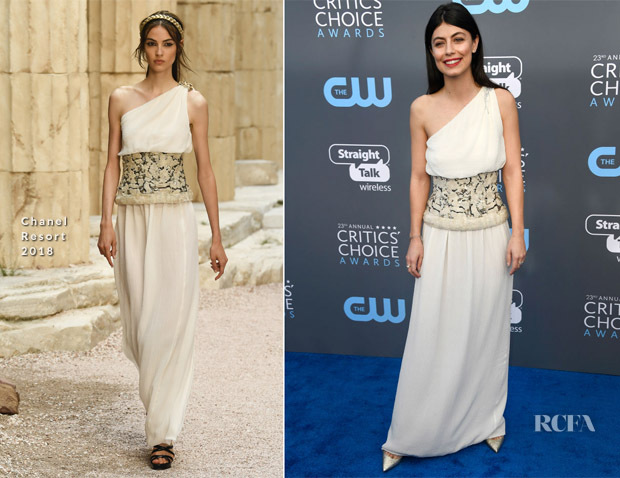 Alessandra Mastronardi was one of the beauties in white at the 2018 Critics’ Choice Awards on Thursday (January 11) in Santa Monica, California. The Italian actress wore Chanel to the 2018 Golden Globes Awards and showed her support for the designer again with an asymmetrical style from the Resort 2018 collection. There is a clear Grecian influence, but she has downplayed it with her accessories, opting for pointed-toe pumps, a sleek hairstyle and a hint of red lipstick. The one-shouldered dress has a refreshing feel that extends beyond the colour. The exaggerated corset waist detail against the flowing fabric is something that hasn’t been overplayed on the red carpet.